The month of incubation is generally a quiet time, but the first of the ‘quiet’ weeks has been anything but… As I mentioned in the previous post, it’s always a roller coaster and I did wonder if (yet) another cold snap would give cause for concern. Well, the start of April did indeed bring such a cold snap, and with it a quite substantial fall of snow, waking up to some 10 cm on the western side of Sheffield on the morning of Monday 2nd (Easter Monday). A quick check of the webcam showed that the eggs were safe, thanks to the devotion and commitment of the parents, particularly the male, which sat tight through the worst of the snow. Once the snow had stopped, he changed position and shook himself off before settling back down. Fortunately, the temperature wasn’t too low and the snow began to melt fairly quickly, and by the time the female took over incubation duties later in the morning it was already starting to go. When analysing the two eggs that failed to hatch in 2015, Dr Nicola Hemmings (of the University’s Department of Animal and Plant Sciences) commented that early-stage embryos tend to be fairly resilient to changes in environmental conditions, such as cold temperatures or delayed incubation, but the risk to the developing chicks is real. Hopefully the committed efforts of the adults will mean that risk has been averted. The other excitement of the week came when we learned that the team at Wakefield Cathdral have been able to read the ring of the male of their pair, and the ring number confirms that he was ringed at St George’s on 16th May 2014, one of the four chicks that fledged that year. We’ve suspected that the ringed Wakefield male could be from Sheffield, and it is absolutely fantastic to know that this is the case. 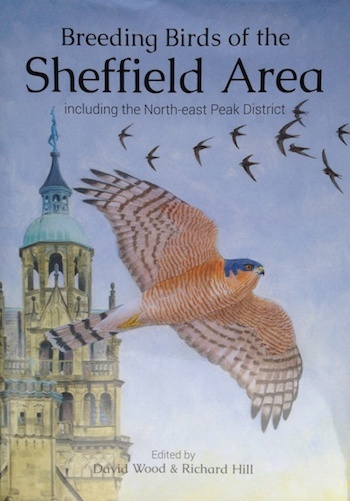 How wonderful to know that the St George’s birds are contributing to the growing urban Yorkshire population, especially when birds in rural settings continue to struggle as a result of illegal persecution. Great too to know that the ringing carried out by Sorby Breck Ringing Group is helping to build a picture of what happens to the Sheffield chicks once they’ve fledged. This is the first definite proof of successful breeding of any of the Sheffield offspring and it’s really interesting that it should have set up in another urban environment. 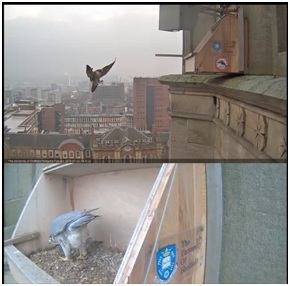 And how fitting that we were able to advise the team in Wakefield on their plans to support Peregrines and provide them with their first nestbox, an exact copy of the St George’s model. They’ve since moved on to a different nestbox, but the pair there have fledged 10 chicks and are on course for another successful season too. A real snowball effect. We’ve still not managed to read the entire ring number of the St George’s male, so if anyone fancies a challenge over the weeks ahead, it would be terrific to be able to find out where and when he was ringed. What odds he’s also from an urban nest? It seems only fitting to close with an image of the 2014 chicks shortly before they fledged, with the Wakefield male somewhere among them. Perhaps this is him below, taking one of his first flights and grappling with a sibling back in June 2014. What a week!